You may have heard some of the hype about IP Video making it’s way into the video conferencing world recently. IP video production in the broadcast and live streaming industry has become an accepted standard quickly replacing traditional HDMI and HD-SDI video cabling… But can the same IP Video technology replace the need for USB cabling in the new-age web video conferencing? Let’s start by acknowledging the incredible advances in networking infrastructure which has made IP video possible. Network switches can move around massive amounts of information in relatively low latency allowing high end video productions studios to use existing or dedicated networks to replace traditional hardware based video switchers. If big name television studios like MTV and the Weather Channel (NewTek NDI users) are making the switch to IP Video, I have to imagine that regular small businesses would be happy with the quality. Now let’s consider what IP Video can do for unified communications. Imagine a world when you can select a virtual webcam input which can select any video source on your network. There would be no need to run USB cabling to any PC in your building because everything would be run over your Network. I have personally tested this theory using our PTZOptics cameras and the NewTek NDI Transmit application. Now imagine a PoE (power over ethernet) camera, selectable from any computer on your network, with no need to run additional cabling. To me IP video is clearly a powerful technology that could transform the way we thinking about video conferencing system design. What if the customer wants access to multiple cameras in Zoom, GoToMeeting, WebEX or Skype? Should we buy an expensive video matrix? Run hardwired HDMI or HD-SDI signals and use a converter box? Or should we do everything over the network with a simple ethernet connection…. The biggest revolution the video conferencing industry, in the past 5 years, has been the rise of cloud based video conferencing services. Affordable cloud-based services paired with DIY, USB equipment has reduced the cost to implement video-enabled rooms around the world. Because USB devices are so easy, I wonder if users will feel the need to adopt the power of IP video? Each room is connected to the cloud via a video conferencing software which provides face to face communications, audio conferencing, screen sharing and even room scheduling in many cases. What more could a company need? In conclusion, I believe IP video will solve many problems in the video conferencing industry. I also believe the importance of high quality, low latency, video over IP may be more relevant in the broadcast and live streaming industry. USB audio and video hardware is so affordable and each space usually only requires a single camera/microphone setup. Yes, there will be a need for multi-camera video conferencing rooms which can benefit greatly from IP Video. There could also be the desire to access camera sources from across the network allowing board-members to tour entire facilities of cameras without having actual cabling routed everywhere. Like anything new, we will have to see this new technology is adopted by the innovators. Once the early adopters have made tutorial videos and certified use-cases, I truly believe IP Video will be the defacto choice for video routing in broadcast, live streaming and videoconferencing. Tomorrow, Friday July 21st, I will have the NewTek CTO, Dr. Andrew Cross on our live show. His mission for the past 3 years has been to make IP Video easy with his NDI (Network Device Interface) IP standard. The technology has been integrated in popular live streaming software such as: Wirecast, vMix, LiveStream Studio, OBS, xSplit and TriCasters. Dr. Cross also has a vision to bring IP video into the world of video conferencing with free and easy to use tools using this protocol. Check out our guidelines for choosing the best network switch for NDI here. 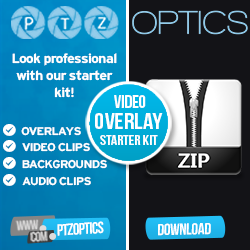 How to upgrade your PTZOptics camera to support the NewTek NDI here. More on Troubleshooting with the NewTek NDI here. Optimizing your RTSP, RTMP and NDI settings for live streaming. Learn more here. 2018 NAB Show interview with Dr. Andrew Cross on the future of NDI here. Check out test results from NDI Cameras with wirecast, vmix, xsplit and Livestream here. NDI HX is the new “High Efficiency” version of the NewTek NDI. Learn more here. Your NewTek NDI questions answered from Dr. Andrew Cross here. 20 Minutes on the NewTek NDI w/ the chief engineer here. The world of video conferencing w/ IP Video & the NewTek NDI here. All your questions about the NewTek NDI cameras answered live here. PTZOptics releases four NDI compatible PTZ camera models here. H.265 Streaming, VLC integration and the NDI plugin here. How to add cameras to the Newtek Connect Pro App here. How to use NDI Transmit for video conferencing with the Newtek NDI here. Using NewTek NDI with Multicast here. Learn how to use NDI & RTSP streaming cameras with OBS here. Bandwidth – Will NDI and NDI HX have different bandwidth? Real data rates involved with HDI|HX? Real, expected latency involved with HDI|HX? This is Gary Bettan’s question – Immediate certification for WiFi routers…. It shouldn’t be a trial and error for customers. There should be a cookbook explaining how to use the recommended routers. Is the 3.0 SDK preferred over v2? If changing to 3 should I see any differences in my application? Birddog vs Spark – Are they offering an identical features. iOS support for receive video function. They are already on version 3 and still no support for iOS. There seems to be some frustration with NewTek charging upgrade fees to access NDI when most software companies like Wirecast, Livestream, xSplit, vMix have included the integration for free. We will be digging into many of the technology questions you may have including: bandwidth, latency and integration with our favorite video software.